I’m sure many of us have heard the story of how, way back in 1979, President Jimmy Carter had a solar hot water heating system installed on the roof of the West Wing, only to have it ripped down by President Ronald Reagan in 1986. Now, given the Obama Administration’s vocal and financial support of the rapidly growing solar industry, and after years of pressure, the White House has finally managed to have solar panels reinstalled. Although largely (and hugely) symbolic, the solar panels are now a lot less expensive and more efficient for the taxpayer to fund than they were back in 1979. The panels should repay the costs within eight years, after which time the power will be free. 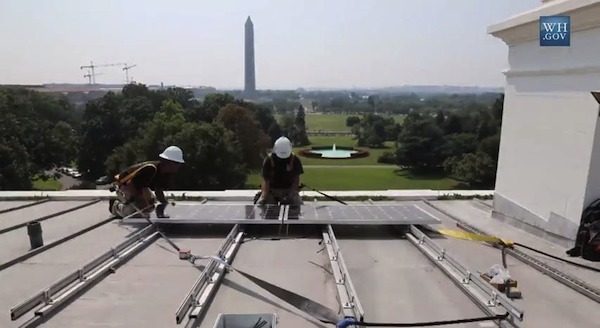 The White House has released a short video about the solar installation to mark the occasion, which explains that the size of the system is typical for the average American house. The whole roof could not be covered with panels due to the atypical security concerns of the historic mansion. During its time in office, the Obama Administration has contributed to the fact that solar power is now the fastest growing source of renewable energy in the US. Although growing exponentially, solar still only accounts for about 1% of total electricity generation, so the US solar industry has a lot of room to grow, and is expected to do so for many years to come. Apart from the new solar system on the White House, Obama has used the occasion to launch some new solar initiatives aimed at further expanding solar power. He announced a $2 billion package for energy-saving measures in federal government buildings, and new training and financing programs for solar installations. These will not need approval from the often deadlocked US Congress.